The Allard K. Lowenstein International Human Rights Clinic at Yale Law School has released a new report titled “Forced into Breaking the Law”: The Criminalization of Homelessness in Connecticut. The report examines how Connecticut’s homeless residents face the threat of criminal sanctions for simply existing. The report also documents how Connecticut city ordinances, such as those prohibiting loitering, panhandling, and sleeping in public, punish people for performing necessary, life-sustaining functions, which effectively criminalizes homelessness itself. It further outlines how the criminalization of homelessness violates state, federal, and international law. The release of the report coincides with National Hunger and Homelessness Awareness Week and the launch of the national “Housing Not Handcuffs” campaign, organized by National Coalition for the Homeless and the National Law Center on Homelessness and Poverty, which aims to end the criminalization of homelessness. “This report sheds light on a system that, through small actions by many actors, puts Connecticut’s most vulnerable people in a detrimental cycle of policing, homelessness, and poverty,” added Scout Katovich ’17, another student author of the report. The report documents the harms people experiencing homelessness suffer at the hands of the criminal justice system every day. People interviewed for the report described receiving citations for loitering while waiting on the corner for a shelter to open. 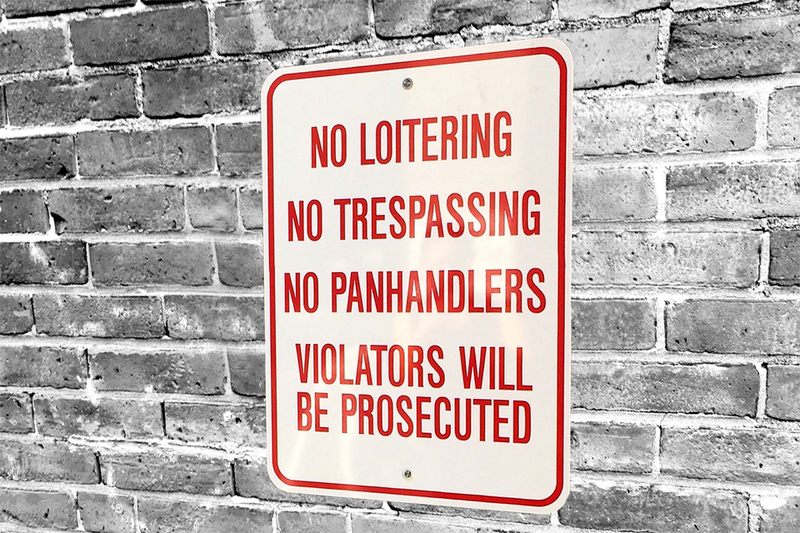 Just for asking for a few dollars, individuals face $99 fines under anti-panhandling ordinances, according to the report. Initial contact with the criminal justice system often escalates and results in a downward spiral, students said. If people are too poor to pay their fine, they must contest the ticket in court. But those interviewed for the report faced high barriers to showing up on their court date. For instance, many people never received notice of their court dates because they did not have an address or lacked transportation to get to court. Failure to pay the fine or go to court can result in arrest and incarceration, making it even more difficult to obtain housing and employment. In this way, the criminalization of homelessness further entrenches a cycle of homelessness, poverty, and criminalization, the report argues. The Allard K. Lowenstein International Human Rights Clinic is a legal clinic at Yale Law School that undertakes projects on behalf of human rights organizations and individual victims of human rights abuses.